International Journal of Research in Health Sciences,2013,1,3,227-230. 1,2- Department of pathology, MRMC, Gulberga, Karnataka, INDIA. 3-PG, Department of pathology, MRMC, Gulberga, Karnataka, INDIA. 4- Department of Surgery, MRMC, Gulberga, Karnataka, INDIA. 5-Department of Biochemistry, NMC, Raichur, Karnataka, INDIA. 6- Lecturer, Department of Anatomy, KSHEMA, Nitte University, Mangalore, Karnataka, INDIA. 7-PG, Department of OBG,MRMC,Gulberga. 8- Department of Biochemistry, FMMC, Mangalore, Karnataka, INDIA. Accessory lobe of liver is an uncommon condition and ‘symptomatic heptocellular adenoma in an accessory lobe of liver’ is probably the first case. A 53 year old female patient presented with acute pain abdomen with history of recurrent pain abdomen since many years. USG & plain CT scan abdomen reported as right anterior abdomen mesentric adenoma. 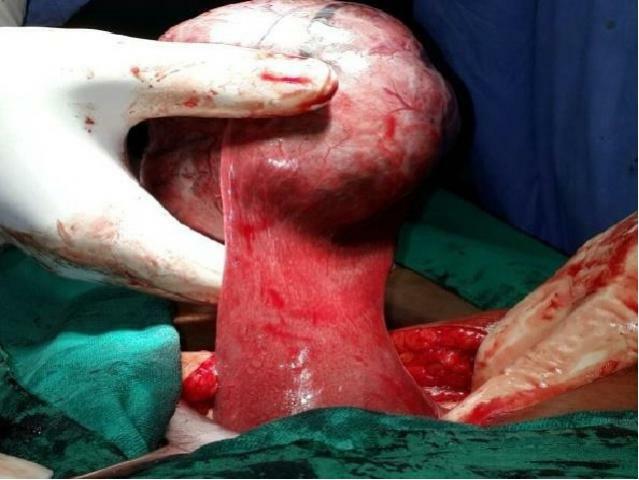 Intraoperatively surgeon found a mesentric mass (measuring 11x9x8 cm) with attached pedicle to liver inferiorly. On histopathological examination it is surprisingly found to be hepatocellular adenoma.